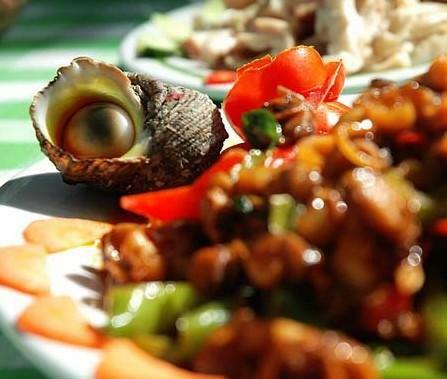 The most prosperous seafood squares assemble at Hexi Road (河西路) of Sanya City. Chunyuan Seafood Square, Mingrun Seafood Square, 168 Seafood Square and Laishifu Seafood Square are in rows at this road. These seafood squares are open and consist of large stalls, only being responsible for cooking the seafood, so the customers should buy the seafood from markets and then bring them here to be cooked. Chunyuan Seafood Square is 100 meters from Chuangye Building at Hexi Road, and people can go there by taxi or by Bus 2 and Bus 4. Apart from eating in seafood squares, it is also popular to eat the fresh seafood in fishing boat. Hongshayupai (红纱鱼排) is the most famous one, which is located in the east of Dadonghai and is a little far. It takes half one hour to get there and the customers have to take a free boat to get on those fishing boats. Many foreigners like this way of eating seafood. Huangliu Duck originates from Huangliu Town, Ledong Li Nationality Autonomous County in Hainan. Huangliu Duck is the newly created food, and is used for cooking hotpot and soup and frying with other vegetables. Some restaurants at Shengli Road, Jixing Road and Xinfeng Road can cook the best Huangliu duck. Guangming Duck Restaurant at Shengli Road is the most prosperous one. So this area is collectively called Huangliu Duck Street. Waimao Road (外贸路) is a place gathering southern and northern snacks. If you wan to taste all kinds of food throughout the country, Waimao Road is the right place. People can take Bus 2 and Bus 4 and get off at Yuechuan Bridge station, and then come to a cross and turn west. After walking about 200 meters, there is a gap on the right wall and the gap is the side door of seafood stall where people can get in.